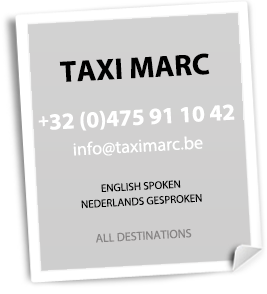 With an experience of more than 20 years on the market of transport of persons, Taxi Marc can offer you the necessary services from 7 a.m. till 9 p.m.
Transport at night, only on reservation. Confidence and security in the proposed performances, everything is organized around one idea: driving you to the required destination, simplifying your life in the most comfortable way. We welcome you in the different airports (Zaventem, Brussels South), and stations with a personalized panel with your name. We are present to serve you from 7am till 9 pm. Transport at night only on reservation.